Neural tube defects are due to improper closure of the neural tube during the first 3–4weeks of fetal development. Neural tube defects produce a wide range of congenital defects of the CNS from anencephaly to spina bifida. 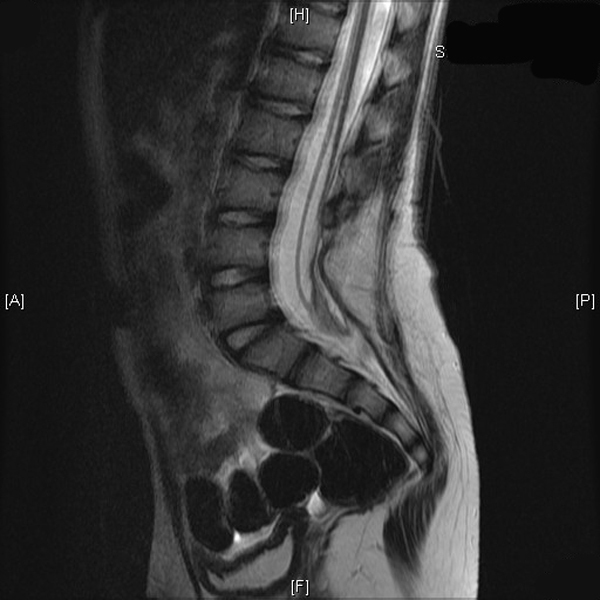 Spina bifida results from the failure of the posterior vertebral arches to fuse in the midline, producing a congenital absence of spinous processes and lamina. Spina bifida occulta is the most common and mildest form, occurring in up to 1/1000 live births with malformed posterior elements at one or more vertebrae. Spina bifida occulta is distinct from spina bifida cystica, including myelomeningoceles and meningoceles, which involve a protrusion of meninges with or without neural tissues through the vertebral defect, respectively. History and physical examination key: No exposure of the meninges or neural elements is seen on physical examination. The history is benign, given that tethered spinal cords are often asymptomatic when occurring alone. A MRI will be helpful in defining the anatomy. Variable symptoms: When a spina bifida occulta is associated with a tethered cord, fibrolipoma of the filum, lipomyelomeningocele, split cord malformation, or dermal sinus symptoms will vary from none to those either associated with dysfunction of the spina cord or from a consequence in the alteration of the local anatomy. Clinical manifestations due to traction or compression: Symptoms that do arise are from traction of the spinal cord or mass compression effects, resulting in neurological, urological, and musculoskeletal abnormalities.